For our holiday season, we decided to go to Deer Valley, Utah to learn to ski, play in the snow, and to have a very merry Christmas with the family. During our week in Deer Valley, we had the pleasure to try the newly opened restaurant, The Brass Tag. We felt like eating at a snow lodge/ snow resort is a huge part of a vacationers experience when coming to Deer Valley, so The Brass Tag was perfect! 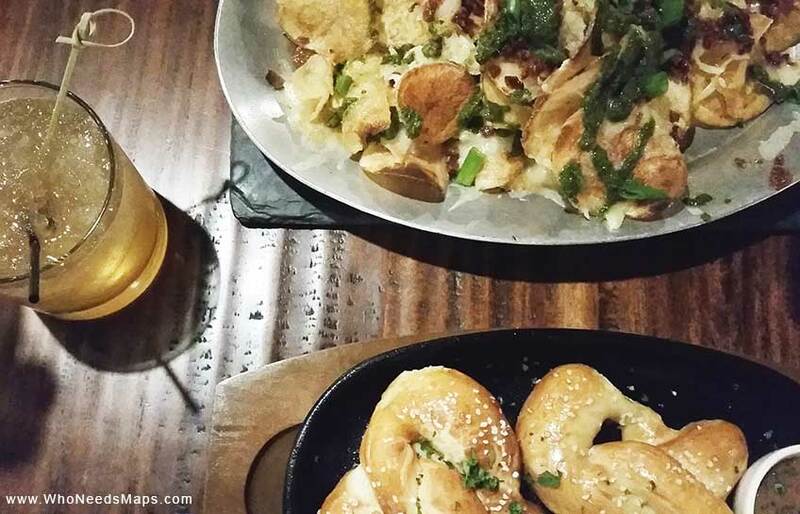 The Brass Tag features a menu that shows off some great culinary skills and combinations; Everything from homemade pretzels, to succulent meats, and healthy salads to pleasantly boozy cocktail concoctions. The most difficult part of the menu, was choosing what we wanted! There were also some amazing sounding specials but we decided to stick with the menu (in case anyone came back, they can find what we had!). 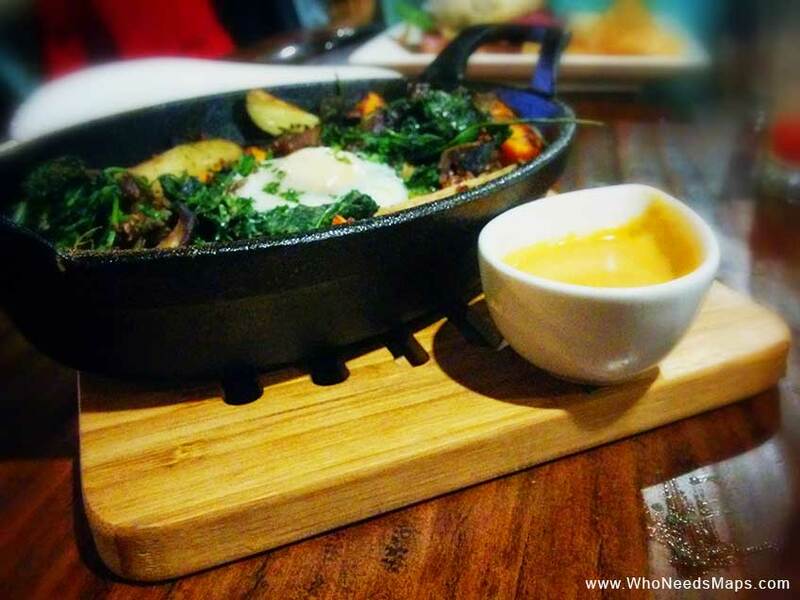 The Brass Tag offers plenty of options for gluten-free, vegetarian and vegan diners, too. Chef Ryan Swarts and Sous Chef Ryan Estel (go Team Chef Ryans!) were the culinary geniuses behind The Brass Tag Kitchen. The Brass Tag in Deer Valley, opened July 19, 2014 and pays homage to the miners and the mining industry in Utah, hence the name “The Brass Tag”. The brass tags were hung on peg boards by miners as a source of ID in the mines. They were able to tell who was gone and who was still left behind by the leftover tags 0n the peg board. 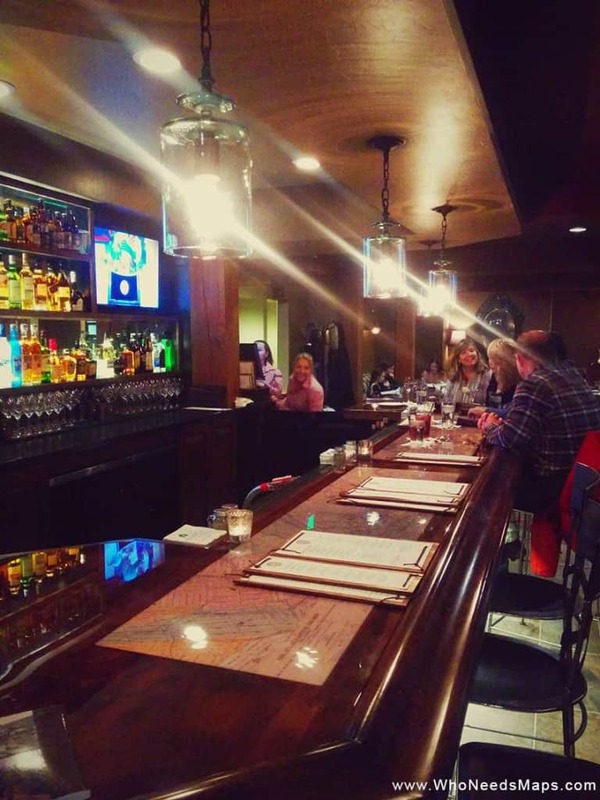 The restaurant is decorated with photographs of the mines in Park City throughout the years, as well as a really interesting miners maps along the bar counter. 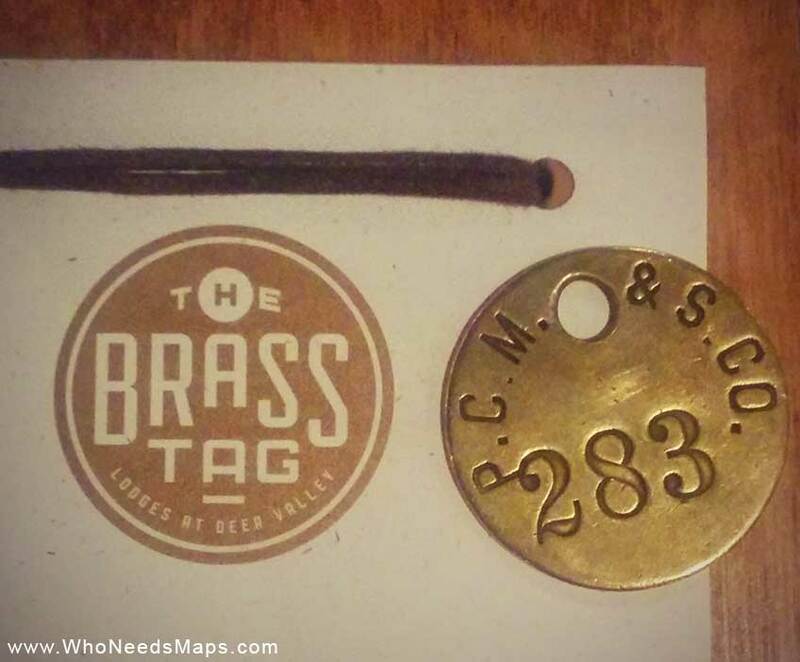 They even received a real “Brass Tag” from a past miner! 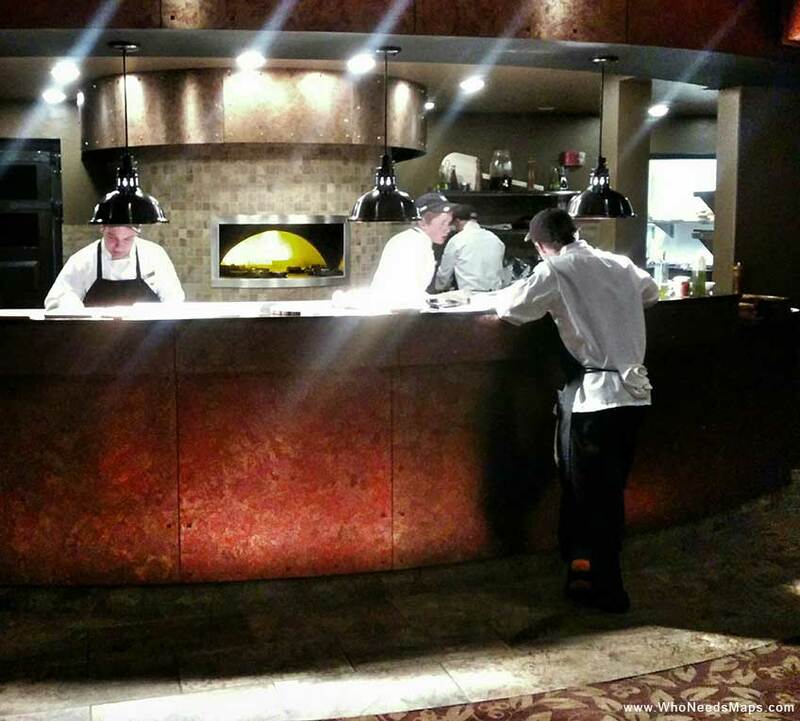 The room is dimly lit, but light enough to see the menu, which gave it that cozy and warm ski lodge feel you desire when you are in Deer Valley. They also have an open kitchen layout so you can watch the chefs in action preparing your meal. It was a relaxed setting with little noise and very lovely ambiance. Also, nearly everything is prepared in a brick oven, which gives the food a lovely gourmet touch and a really wonderful taste. We chose to go for a drink to share between us, called the Keetely. It was a wonderfully boozy and delicious! It is the most unique drink on the menu, the Keetely is made out of Beefeater Gin, St. Germaine Elderflower Liqueur, sweet vermouth, house made lemon and lime bitters, and a beautiful orange shaving and a cherry for that extra special touch. 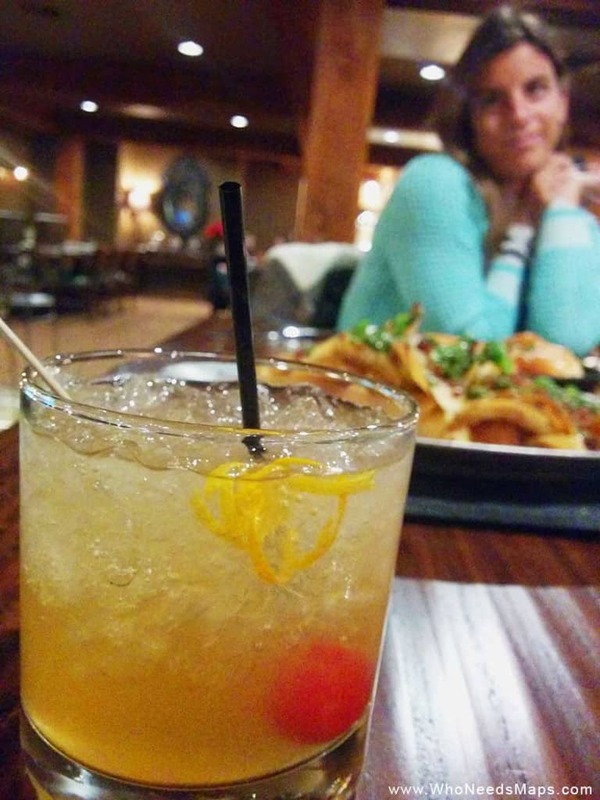 It was strong, it was tasty, and it was unlike any drink we have ever had! Thanks, Alex, for the recommendation! 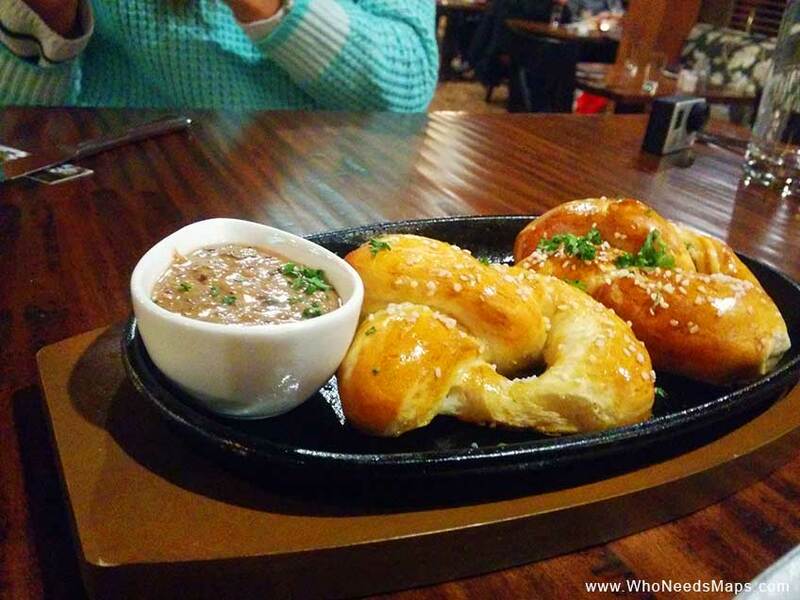 To start with, we had the freshly baked Homemade Pretzels with a mustard sauce made with brown butter, apple cider, and fig. 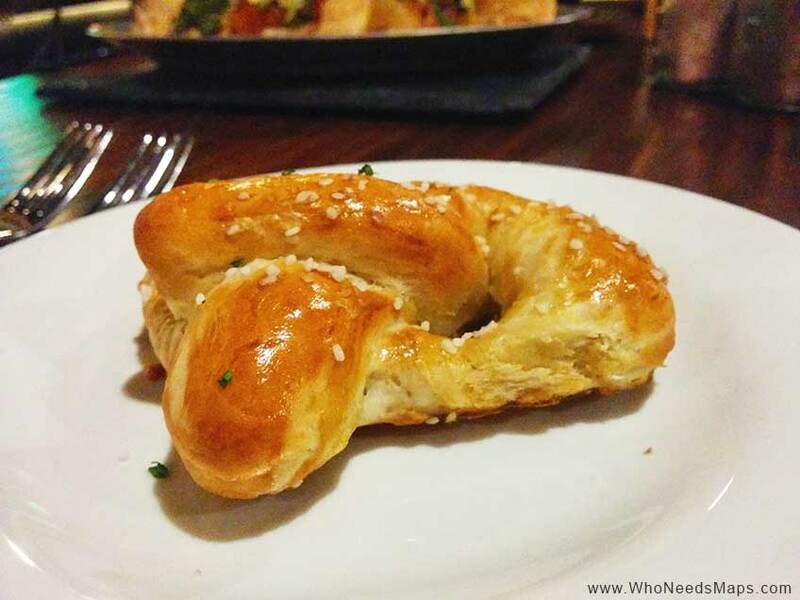 The Pretzel was warm and soft with a crispy bottom, dashed with a touch of salt. The mustard dipping sauce was a nice accompaniment to the pretzel, although we found it a touch too sweet, but it was still really tasty. We also indulged in the Oven Fried Chimichuri Chips. 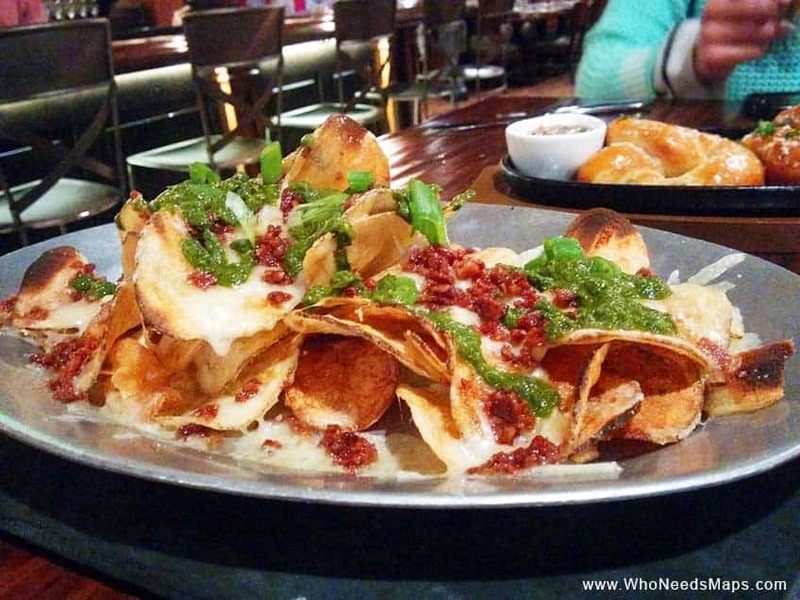 When I say indulged, I mean we devoured every morsel of bacon and cheese and saucey goodness that was on that plate! It was just a big plate of homemade chips covered in melty gruyere and cheddar cheese, bacon bits, and a yummy chimichuri sauce. Lets be real here, is there anything better than bacon and cheese? On chips? We’ll take two, thanks. It was a great start to our dinner (and probably why were so full by the end!). 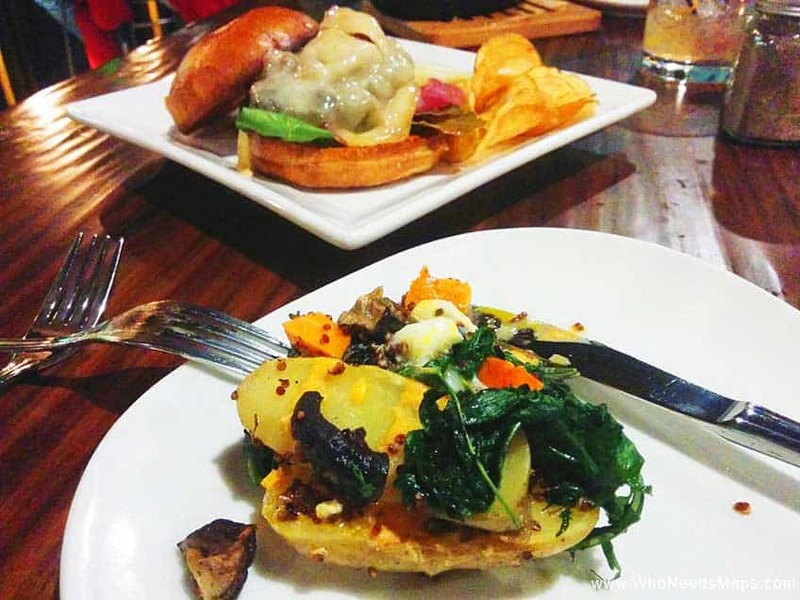 For our dinner, we had The Brass Tag Burger and Mushroom Trio and Potato Hash. The burger was juicy and full of flavor. It was a half pound hand patty Niman Ranch ground beef, topped with Pancetta (the fancy bacon! ), pickled onions, spinach, gruyere, and a delicious smoked paprika aioli with a tasty pickle on the side. 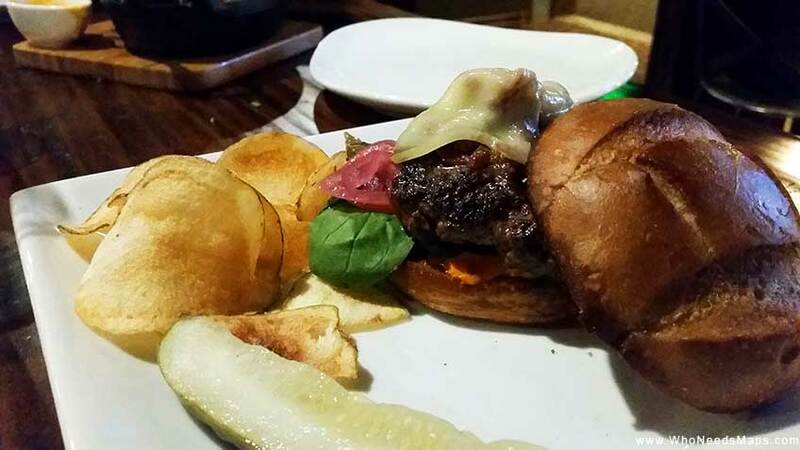 I don’t know if you can tell, but we love bacon and cheese, so this burger really hit the spot. The Mushroom Trio and Potato Hash was a great accompaniment to the burger. With mushrooms, sweet and fingerling potatoes, egg, red quinoa, and a delicious red pepper sauce to pour over, we were pretty happy. We love the natural rich sauce breaking the yolk creates, but the red pepper sauce really cut that richness and it was really wonderful. It was a beautifully composed dish and tasted amazing as well. At this point, we were so beyond wonderfully full that when it came to dessert, we were physically unable to eat anything! The manager, Josh, made sure we tried their famous skillet baked chocolate chip cookies and the blackberry kiwi cobbler with a whiskey anglaise sauce. Yes, whiskey! Thankfully, Josh understood how delicious The Brass Tag food is and how full we were and allowed us to take them home. When we finally had some space in our stomachs to try these tasty goodies, we were super happy Josh forced us to indulge in these. The skillet cookie (although, not in a skillet because we took it home) was made just like the classic Deer Valley cookies, soft, warm, and so delectable. Of course, we helped our selves to eat it with a scoop of vanilla ice cream. They serve it with your choice of ice cream, but obviously, vanilla is the right way to go! The cobbler was nice, although we thought that blackberry and kiwi was an odd mix. The mix was a bit too floral for us but the crust and that anglaise sauce when heated was unreal! We also had the pleasure to chat with Josh about his perfect meal at The Brass Tag! The Brass Tag is conveniently located on the second floor in The Lodges at Deer Valley, in the snow park area. We got there by going to the St. Regis, down the funicular, and a complimentary shuttle took us to the Lodges. The street address is 2900 Deer Valley East Drive, Park City, Utah 84060. If you are staying at the Lodges at Deer Valley, than The Brass Tag has some perks for you! They do complimentary breakfast for in house guests at the Lodges at Deer Valley! They also do take away for those staying at the Lodges and at Silver Baron Lodge. Awesome right? Overall, we really enjoyed The Brass Tag and hope to go back again when we visit Deer Valley! Thank you Josh, Emily, and Alex for a superb time and this opportunity. We had a great time! **Please note, we received restaurant credit for our dinner. All opinions are objectively our own. If you know someone heading to Deer Valley, feel free to send this to them!